MINI Cooper Acccessories + MINI Cooper Parts :: OutMotoring.com MINI Blog :: MINI Lifestyle :: Do More with Your MINI! Synopsis: With a hidden hitch receiver and optional drawbar and wiring kit, you can add a bike rack, cargo platform or other attachments! When I/Out Motoring needed to haul a bundle of stuff from our facility in Ohio down to the Tail of the Dragon event in North Carolina, I relied on the Mini Do More Hitch and Trailer system to get our product and displays down in style. While impossible to get all the product and displays down inside the MINI, this system allowed to transport more than I ever imagined. In fact, most people were shocked at all the stuff I brought. The base system is a simple bracket that is hidden behind the stock bumper assembly and can only be seen if the oval plate (or fog light/reverse light on the Gen 1 MINI's) in the center of the lower rear bumper is removed. On the Gen 2 MINI's there rear lower grill is modified to allow access to the hitch which allows you to hook up a number of accessories including many off-the-shelf trailers, bike racks, trays, etc. The vast majority of MINI drivers will use this base Hitch plate in conjunction with an aftermarket bike rack attachment (like Thule, Yakima, etc.) while a fair amount hook up one of the flat extensions for autocross tires, etc. 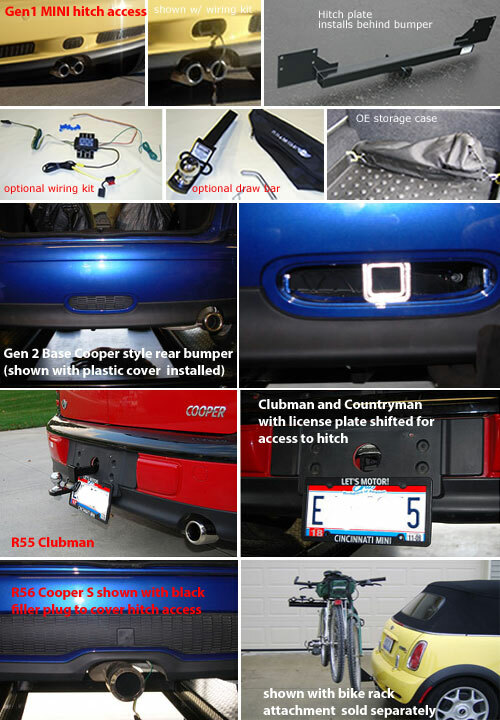 To top it all off we also offer is a custom wiring kit that is easily installed and allows full safety features like brake lights, etc. on the trailer. Comments on Do More with Your MINI!